Otherworld is our most actively developed game and our main focus at the moment. Although updates tend to be few and far between on this blogsite, work on the project is still ongoing. I’m sure no one wants updates on every single detail, so we’re only focusing on the major ones and other related posts of interest, often compacting them into a single update entry. First and foremost, her current dress is the Queen Dress asset. However, rendering doesn’t remove the dress "handles" and frankly it’s annoying editing them out in GIMP each time. So we decided to try something else. And secondly, Tina thinks that Swan should have a more Gothic/Victorian styled dress. Hence, the process of elimination has begun, trying out different outfits to see which ones are more befitting. I don’t know what Tina’s plans for Swan, but, developing the character is her brainchild, she has a clear idea of her redesign. 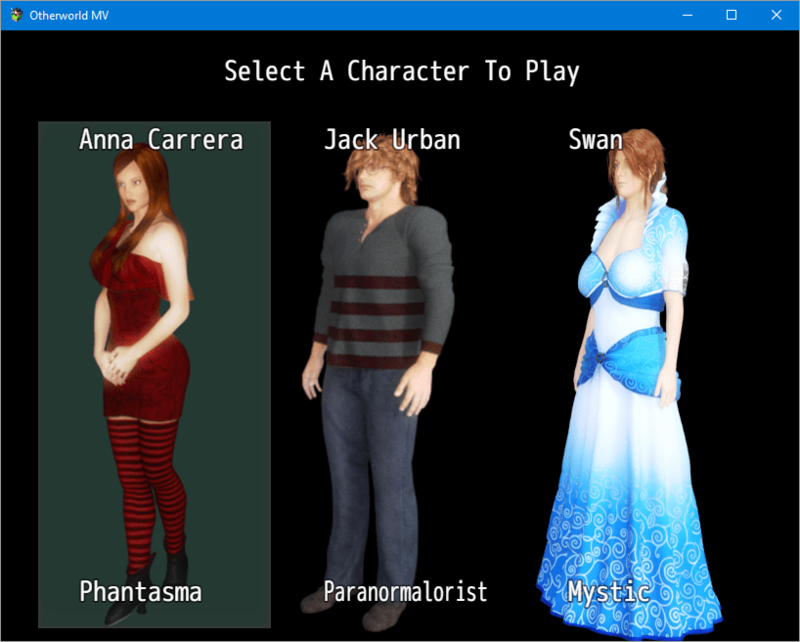 I finally finished the Character Selection Plugin. The screenshot (right) shows its setup in the game. Swan’s profile graphic shows her present clothing, not her forthcoming wardrobe. As it stands right now, Swan’s shape and form needs no further development. However, she may or may not have longer, darker hair in the future; that’s something for discussion later. When Tina decides the new outfit for Swan, and whether to elongate her hair, I’ll re-render Swan and swap the graphics accordingly. The customized tilesets aren’t fully designed yet, so I’m using the RTP for templates and will convert them later. Because there’s more written out for Anna, the focus is on her story for now. All maps are being created for her first, along with her storyline. At this point, I’m not sure how to proceed with creating the tilesets, as I’m still familiarizing myself with dimensions and layouts. This may require a bit of experimentation and, subsequently, time. I’m aiming for showcasing some of the template maps soon, hopefully within the next few weeks.